Loch Ness Scotland - Nessie or not the loch is no monster! Loch Ness is a large, deep, freshwater loch in the Scottish Highlands and is one of the most visited locations in Scotland. In fact it is the most famous lake in the world, loch being the Scottish word for lake or fiord. Loch Ness is a substantial body of water about 24 miles long by one mile wide and at its deepest point it goes down nearly 1,000 ft. There are about 40 small rivers, streams, burns and waterways running into the loch. Loch Ness lies at the northeast end of the Great Glen in the Highlands of Scotland and occupies a large part of the Great Glen fault. The Great Glen is a geological fault running across the entire width of the Highlands of Scotland. It runs southwest from Inverness right down to Fort William and contains three freshwater lochs - Loch Ness, Loch Oich and Loch Lochy. Take a walk from the cottage down to the shore of Loch Ness. 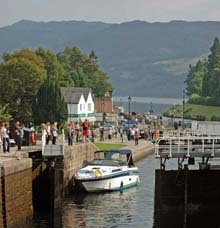 These lochs are linked by the Caledonian Canal which enables boating craft to journey from the east coast to the west coast passing through stepped lock gates at Fort Augustus and at Fort William. Fort William is situated near the west coast on the sea loch Loch Linnhe and is overlooked by Ben Nevis, the highest mountain in the British Isles. The Caledonian Canal was built by Thomas Telford in 1803 and eventually opened in 1822. It has 29 lock gates to navigate along its 60 mile route. Loch Ness is about 52 ft above sea level and, because of its depth, it has a larger volume of water than any other Scottish loch - although Loch Lomond has a larger surface area it is not so deep. Loch Ness is said never to freeze and maintains the same temperature of about 4C throughout the year. It contains more fresh water than all lakes in England and Wales combined and is the largest body of water on the Great Glen Fault. Loch Ness is about 10,000 years old and was formed at the end of the last Great Ice Age during which The Great Glen had been filled with a huge glacier. The water becomes deep very quickly and the sides of the loch suddenly plunge vertically down into extremely murky water due to the high level of peat content - swimming is not recommended! Loch Ness is connected to the Moray Firth via the Caledonian Canal and the River Ness in Inverness. At the eastern end of the loch is the village of Dores, at the other end is the settlement of Fort Augustus. The village of Dores has a wide crescent shaped beach which is a popular venue for walkers. From the beach there is a good walk through Torr Woods. Enjoy a drink at the Dores Inn. There have been unconfirmed reports of a Loch Ness Monster since the 15th century, affectionately known as 'Nessie'. Enthusiasts trace the first sighting of the Loch Ness monster back to St Columba in the 6th century. His early biographer, St Adamnan, tells how he used the sign of the cross to repel a monster in the river Ness. Since then there have been numerous sightings which have been seriously reported and there have been many intensive scientific investigations. The Loch Ness Exhibition Centre in Drumnadrochit takes visitors through 500 million years of Loch Ness history using a highly effective mix of lasers, digital projection and special effects. It charts the history of the monster by exploring Scotland's geological past, its folklore and the various research projects carried out on the loch. Towering above Loch Ness on the NW flank can be seen the conspicuous dome shaped peak of the Loch’s highest mountain – Mealfurvonie – gaelic for ‘mountain of the cold moor’ which reaches an altitude of 2,284 ft above sea level. The view from the summit is extensive and allows commanding views from Fort George in the NE down to Fort William on the SW, a distance of 70 miles. The only island on Loch Ness is Cherry Island, visible at its southwestern end, near Fort Augustus. It is a crannog which is a form of artificial island construction of stone and oak wood, probably used as an Iron Age fortified refuge. 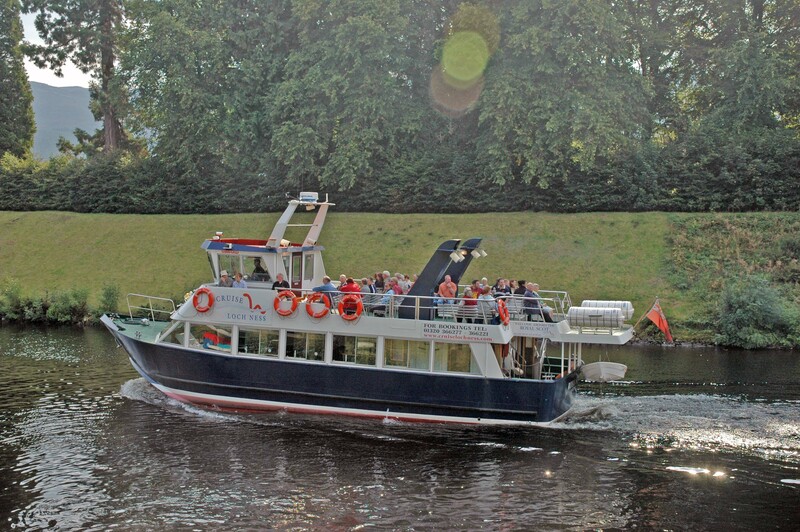 There are twice daily trips all year round from Inverness on Jacobite Cruises which sail along the Caledonian Canal, out onto Loch Ness and along to Urquhart Castle which juts out on a headland on the northern shore near the village of Drumnadrochit. This magnificently situated Castle remains a very impressive stronghold despite its ruinous state. Once one of Scotland’s largest castles, Urquhart’s standing remains include a tower house that commands splendid views of Loch Ness and the Great Glen. It is steeped in history and conflict and the story is unfolded in the new Visitors Centre which was built in 2002 sympathetically into the hillside. It is a worthwhile stop when travelling round the loch on a day trip by car. The loch is a very busy stretch of water, especially from Easter until late October and is used by a wide variety of boating craft. 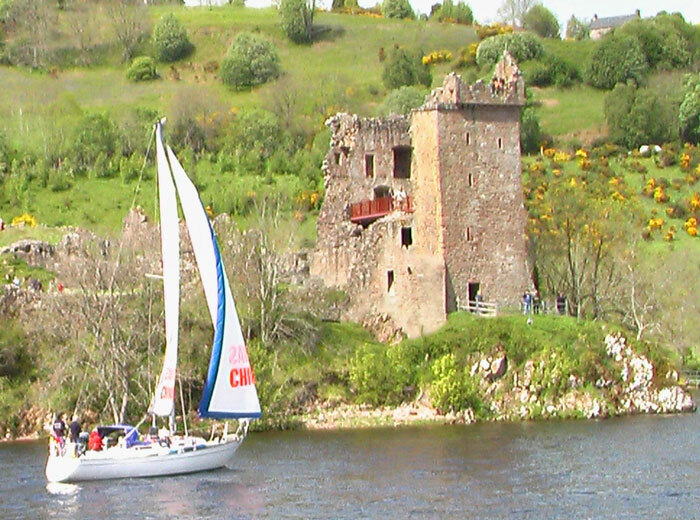 Fully equipped motor cruisers can be hired from Caley Cruisers in Inverness for weekly or short-break charter. Larger private cruisers and yachts of all different shapes and sizes can be seen busily tacking against the wind or just drifting on the still waters. There is a regular 1 hour boat trip onto Loch Ness from Fort Augustus on The Royal Scot equipped with sonar for an interesting glimpse of life under the water. The magnificent liner ‘The Lord of the Glens’ travels regularly from Inverness through the Caledonian Canal into Loch Ness and down the lochs of the Great Glen and beyond. The ‘Fingal’ activity barge equipped with bicycles and canoes can frequently be seen taking groups of people of all ages on an adventure break. The loch is also used by a variety of working craft such as trawlers, fishing boats, Royal Navy boats and barges and is a welcome short cut compared to navigating the choppy Pentland Firth in the far north. Take a very exciting and exhillerating ride on board the 'Ness Express' RIB [Rigid Inflatable Boat] which operates from Fort Augustus to Urquhart Castle and back. 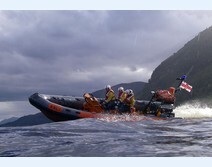 Since April 2008 Loch Ness is now home to the first RNLI Lifeboat [Royal National Lifeboat Institution] on the inshore waters of Scotland. This is the first time in 13 years that the RNLI has placed a lifeboat in a new location in Scotland. A car journey round Loch Ness is about a distance of about 70 miles. Look at ‘A Journey round Loch Ness’ which provides a detailed car journey with photos.